Okay, I am actually having a lovely Monday, but my neighbors are making me completely crazy. If you are attached to me through Facebook you have already heard a bit about my woes involving our neighbors on one side. Let me start by saying that they happen to be the nicest people on the planet and they keep their yard meticulously manicured. Unfortunately, that latter part is what causes all the crazy. They are a retired couple and their hobby is their yard. According to them the previous owner never got around to taking care of things in the area between the yards before they could get to it, so they have always maintained the natural space between the properties. From what we can see no normal human being (okay, make that regular working Joe) could get out to the yard fast enough to beat them to any of the work that needs to be done. An example of what we have experienced would be, before all the leaves can even hit the ground they are out there to rake everything up in the natural space, shred it, spread it and keep it looking like an office park. Part of what made us fall in love with our home was that the yard is full of trees and has (like most of the homes in the neighborhood) a natural buffer between each home. One side of our property looks like woods, with nice thick trees and leaves on the ground, while the other side has every twig and leaf picked clean and any tree that is not up to par with the neighbor’s standards quickly sawed right down to a nub. I know I sound like a big whiner that should be thrilled with living by such diligent, tidy neighbors that basically keep up one side of my yard for me. Well, I’m here to tell ya’ that living next door to retired gardeners has now made it to my list of “Things I will never live by” because during the summer and fall last year there was a constant sound of lawn equipment emanating from their yard. The space between our homes looked like a video rolling a little two fast with the two of them running around busy beaver style trying to rake up every last leaf and get it through the shredder at record speed. If it weren’t for the annoying sounds that radiate from their yard starting around 9:00 am and going until about 6:00 pm or later, the scene would be pretty hysterical. The other issue is that the area between our yards is mostly ours. Only a narrow strip of that space is actually their property. Now that we are coming in to spring and early summer The Mister and I are starting to plan for a little yard revamp and are having a tough time figuring out what to do about the folks next door. We are at the point of wanting to plant a thick hedge or add a fence right down the property line to keep them over on their side, but we think both would look weird in a space that is supposed to be just woods and not manicured at all. Ideally we would like to see the middle section left alone with the leaves left to naturally compost in the middle. 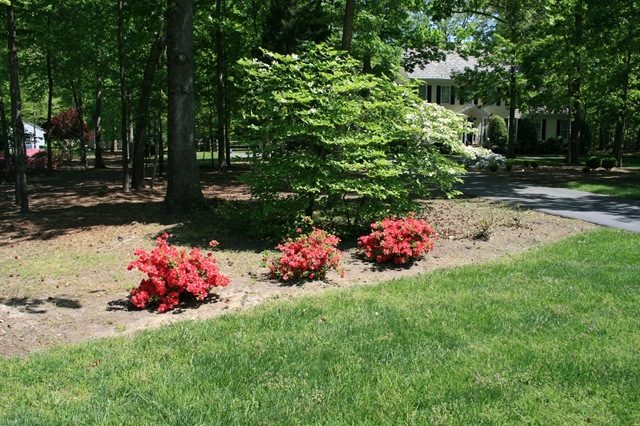 Then along the sides near our driveway we would like to keep up mulched beds with small flowering shrubs and seasonal bulbs and flowers. The photo below shows an area that, although it needs some work, is exactly what we would like to see all the way around this buffer between our yards. I have mentioned this to the neighbors twice and they insist they don’t want the leaves…they have allergies (this makes no sense to me at all). They also have mentioned other plantings that we should do since apparently what we have in mind is not up to their standards. So, here we are wanting to fix up our little dream home and feeling sick about the idea of upsetting the people we have to live next to for God knows how long!?! We know we need to speak up and take back our land…ha!…but we just don’t know how. The reason I am writing this today is not just to vent, but to ask for some advice. If any of you have a gentle way that we can get through this problem, some simple words of wisdom, or planting tricks to help us out we would really appreciate it. The Mister and I are just starting to crumble and while we don’t want to give in to living with part of our yard being commandeered by another we are afraid that speaking up with only make things really terrible. Please, please leave a comment and let us know how you would handle our situation. Keeping these last few things in mind, I will now commence to begging for any advice at all. Please, throw it at us! Again, I don’t mean to sound like a big whiner I just want to keep a healthy and good relationship with my neighbors while also having the yard I envisioned to go with my home. 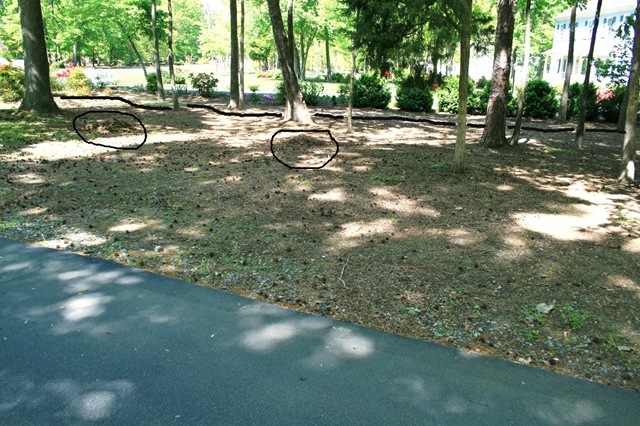 PS-I decided I was going to say something about the latest transgression involving a couple piles of yard waste that they raked up from their side and pushed on to our side of the property (see below). It has been sitting their a week and making our blood boil every time we see it. I decided today was the day I was going to say something, so I went out to water some plants out front and try to talk to them. Let this go on record as being the first time I have ever been in my yard in full view of the neighbors when they have not come right over and started up a conversation with me. It was strange, but they must have been really busy. So, I let it go. Crazy Neighbors And Mondays Always Get Me Down – UpdateTargets, Targets Every Where!Budget? We Don’t Need No Stinking Budget!! Quite a few years ago, my father worked with a man who owned a chain of discount stores. Whenever any of his employees had a dispute, he would call them into his office and tell the person to repeat after him, "I love so and so". Everytime the person came to their mind that is what he told them to think. This man was a remarkable man and lived what he preached. I think the first step is "love thy neighbor as thyself" --when you truly love them, it may prove easier to know what to do and what to say to them. My sister tells me that we can say whatever we want to people as long as we have a smile on our face. Before my father died, in his last years he said everything we do could be summed up in one word..."love". So there is "my" advice, love them, and talk to them with a smile. 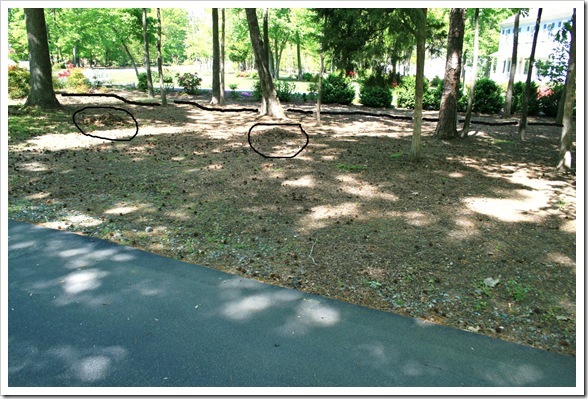 I had one neighbor who reported my back yard one year in early spring when we were having a monsoon and our yard was not able to be mowed in the back area--our neighborhood has a huge problem with drainage. I wrote her a letter telling her how much I appreciated our friendship through the years and how it hurt me that she would do such a thing without talking to us first. She called and apologized to my amazement and said she was just having problems with the people on her end of the street. Not all people will respond logically or lovingly, but I think it's our responsibility to "take the high road" and try to do the right thing. Beyond that forget about it and "live" "your life". Be sure to compliment them on their fine work and tell them how "you could never do it as good as them". So I could ramble on, but I'll get off my soap box now. Good luck! What if you planted ivy or vinca in the space? Some kind of ground cover would be low maintenance but still keep the sort of wild look you're going for. Vinca produces pretty purple flowers about this time of year, too. You should be able to do whatever you want with it. It's your property. They don't pay taxes on it, so they don't have any say about what you do with it, in my opinion. I don't think I was much help, but I can empathize! Let us know if you end up saying anything, and good luck! We had a similar situation. As you know, Hubby lived in our house his entire life. The next door neighbors had been there the day he came home from the hospital. 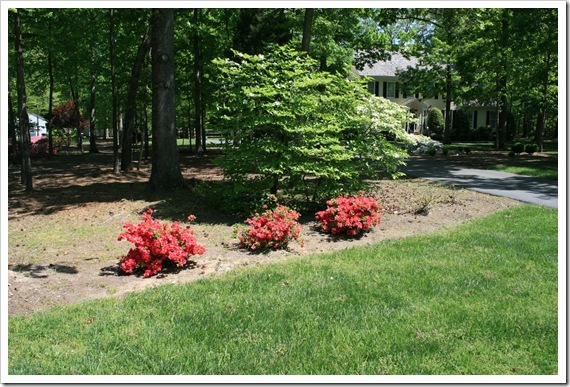 They would see an empty space in the yard and plant a shrub or bush or tree. No rhyme or reason, just loads of stuff everywhere. The side part of the yard that divides our two homes was technically our property but Hubby's dad was allowed them to plant stuff in it so he wouldn't have to mow it. Well, they moved out and someone else bought the house. Hubby went over and explained that all those shrubs and a HUGE foster holly were actually on our property and he wanted to cut them down. He just wanted to let them know what was going on so there was no hard feelings. He explained that he'd always hated them but wanted to be nice but now that they were gone he was taking this opportunity to take back our poperty and it wasn't a reflection on them and we certainly weren't trying to be un-neighborly. They were fine. A couple years later, they had a Bradford Pear tree (which are notorious for splitting) that started to split and started to lean over our driveway - and the cars in it. Hubby kept getting more and more nervous and finally went over and mentioned to them that we were concerned that it would come down one night and smash my car. They said they had been thinking the same thing and cut the tree down within the week. Both times, we just went and knocked on the door and were honest. We didn't come "at them" we just shared our issues. If that's the case then I must say it's a problem that must be solved through a nice and peaceful conversation to settle things up. I had a similar case with you in my former house in Nevada, but we settle things and made a good decision.